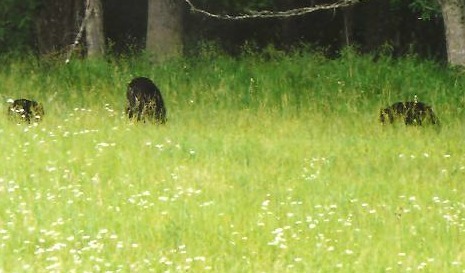 Black Bears in the Smokies, Oh My! Black bears can be a cause for excitement, but also fear. Remember that this is their home you're in. When you're smart about bears, you can enjoy your stay in the Smoky Mountains even more. Check out these tips before you visit the Smokies! 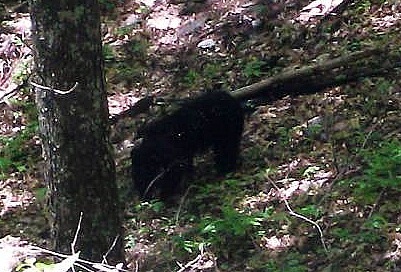 -There are about 1,500 bears within the Great Smoky Mountains National Park. That makes for 2 bears every square mile. -There has been 1 reported human death by a black bear in the park. -Black bears can be 6' long and 3' tall at their shoulder. A male bear typically weighs 250 lbs. Females are a little over 100 lbs. By fall, their weight can double! -Bears are their most active in the early morning and late evening. They mate in the summer. -It's illegal to get closer than 150' to a bear. -Don't feed the bears or leave food out. Most problems come from bears getting used to eating people food. A bear that eats human food lives half as long as one that doesn't. -If a bear comes at you making loud noises and/or swatting the ground, back away slowly, but don't run Why not? Bears can run up to 30-35 mph! -If a bear follows you, shout, throw rocks, stand on something, and raise your arms to look bigger. You want to scare it off and leave you alone. -When camping, keep your food and sleeping areas separate and free of food odors. Don't store food in your tent! -If you want to not sneak up on a bear while you're out hiking, try a bear bell. I have one attached to my pack while I hike. It's purpose is to make noise so that you make noise and scare the bear off before you have an encounter. Black bears don't hibernate in the winter, rather, they are in a deep sleep. If something, or someone, disturbs them or if the weather gets warm, they'll roam about. Bears hide out in their winter dens, not only because of the cold climate, but also due to the lack of food. Most black bears who live in the Smokies head for their dens in December. They'll be out and about by March or early April. What's Your Black Bear Story? Do you have a story about seeing a black bear in the Smokies? I'd love to hear what happened! Everyone would love to hear your story! Do you have some black bear pictures to add? Great! Click the button and find the first one on your computer. Select it and click on the button to choose it. The maximum image size accepted is 800x600. If your photo is larger than 800x600 pixels you can edit it for free at http://www.picnik.com/.